Professor Messner is not your typical trainer. Neither is he a typical academic. He knows what the ground reality is like, for a business unit head in London trying to get a new project approved, for a business consultant improving a client's operational effectiveness in Frankfurt, or for an associate on the delivery floor in Bangalore. Because he has worked in international management positions, and as a management consultant for high-profile clients - in the US, UK, Europe, and India. His courses taught at the Darla Moore School of Business are listed here: Courses. For future expatriates, business travelers, and 'desk diplomats' who work with Indian colleagues in a geographically distributed environment. Globalization has put India at the world's center stage. But when project teams from Western cultures first come into contact with their Indian counterparts, prejudices against the new and unknown typically amplify. This training improves corporate effectiveness by increasing cultural sensitivity, and acquiring appropriate intercultural collaboration skills. It drastically decreases the risk of project failure. Best taken in the early stages of a project with India, but better late than never! For business associates working in multicultural project teams, either onsite or in a geographically distributed environment. Building cohesive multicultural teams means building success. But managers, in far too many cases, simply brush off cultural issues. Why? Because they are difficult to define or to measure, and at times delicate to talk about. Intercultural misunderstandings mostly occur due to differences in communication style, reasoning, and expectations of each other. Only if everyone faces up to cultural differences it is possible to bridge the intercultural divide, and build strong teams. For business managers involved in preparing investment decisions for top-management approval. In practically all organizations, investment decisions are justified with a business case. But many business cases are based on unrealistic assumptions: They wrongly quantify costs, and optimistically estimate benefits. In short, they are the real reason for many wrong investment decisions. This course provides the knowledge, processes, and tools to build sound business cases based on the elements of cost, benefit, risk, and strategic flexibility. The industry-adaptive curriculum features visits to Mumbai, Bangalore, and Mysore over the course of a week, touring multinational company sites as well as local businesses and a school for underserved children. 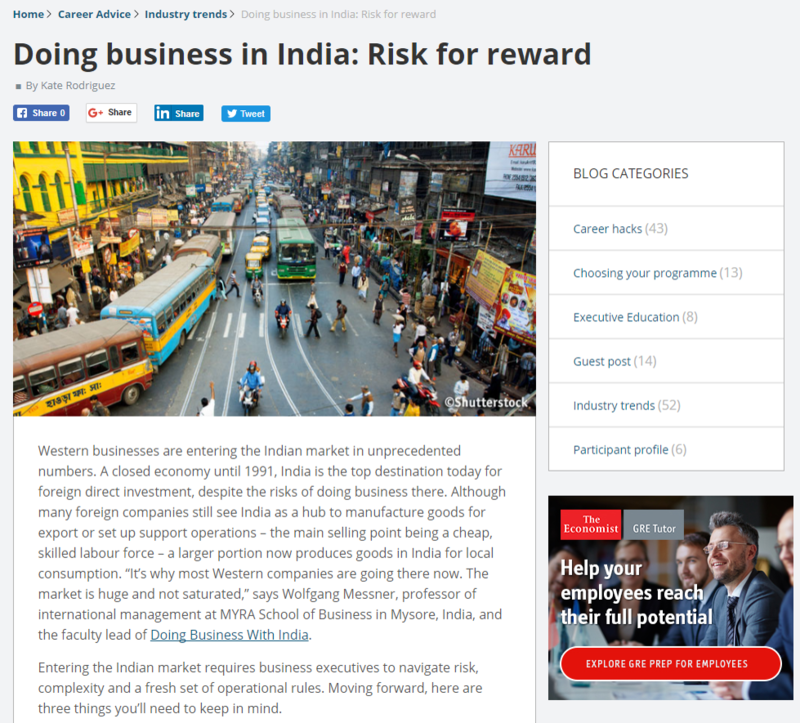 It’s all designed to give participants a deeper understanding of Indian work culture, consumer demand and investment risks and possibilities. 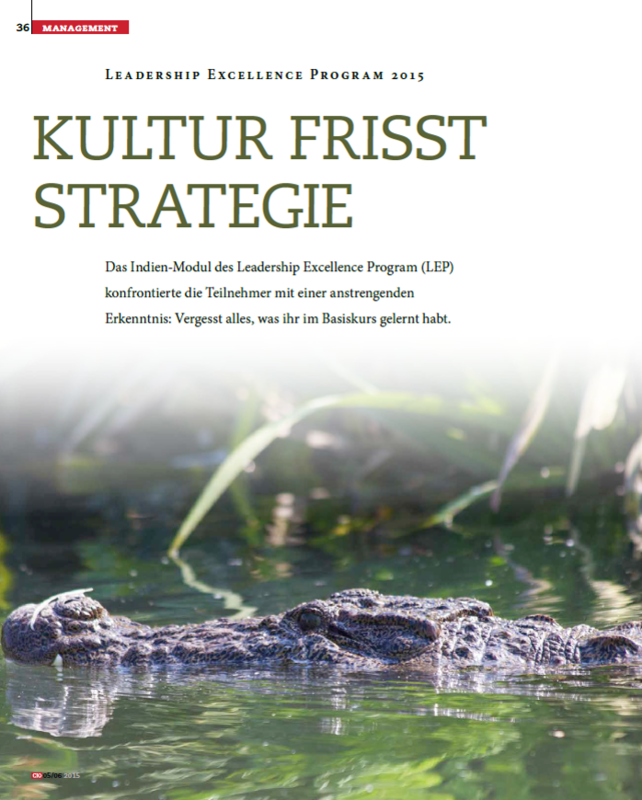 Horst Ellermann, editor in chief of the CIO.de Magazine and a program participant, highlights the importance of attending to cultural aspects when doing business in India. The best strategy fails if it needs to fight an established culture. Academics and practitioners agree. Including Wolfgang Messner, Associate Professor of International Management at MYRA School of Business, whose resume features both business and academia. Messner has been living in South India for the past seven years. There is hardly any place on earth where leaders can test their leadership qualities - because domestic strategies don't work there. Messner knows that. A really insightful course, taught by an engaging and humourous coach. Thank you! A very impressive seminar and certainly unique in its form. The seminar offers hands-on yet indepth information enabling our teams to successfully collaborate with our providers. I appreciate the efforts taken to explain and narrow the divide between different cultures and business communities. Wolfgang's training on Working across Cultures was very well received by all the participants. The realisation of cultural differences and the learning about the values of other cultures is very useful in our international business. Initially, the participants were sceptical about the program but when it started and went ahead, it was very enjoyable and learning was easy through examples and video clips. It gave us the right understanding and approach towards intercultural differences. Many thanks for the excellent training! It has been very well received by the team and myself; I am sure it is going to be helpful to master our upcoming challenges. Very vivid and broad review with many helpful hands-on examples. Doing business and meeting cultural differences are a given. But when you understand why people behave the way they do, things become far simpler. I thought I knew the nuances of how to do business – but this session helped me to look beyond the obvious. I thank Wolfgang Messner for his effort in supporting our Indian projects. As a trainer and coach he manages to convey images in his workshops that adequately reflect the reality and thereby help our employees to safely, respectfully and thus successfully collaborate with their Indian colleagues. In addition, the seminar opens a door to a rather different, impressive culture. We consistently receive a very good feedback from the participants – and an excellent one after their first visit to India. Plant Manager, KHS USA Inc.
Wolfgang's training was both insightful and educational; I now understand the behavior, values, and culture of my colleagues from India and Germany better. Thank you! © Wolfgang Messner. Design: TEMPLATED.